Happy New Year! Sorry to have been missing in action for the last few weeks of 2012. I got wrapped up in family stuff and holiday stuff and just didn't have a lot of time to read and write about books. But it's a new year and I'm ready to take a look back at what I read in 2012. It's a bit different than 2011. I read a lot more nonfiction in 2012, and fewer thrillers/mysteries. This is mostly due to the fact that I hosted the Non-Fiction, Non-Memoir Reading Challenge. 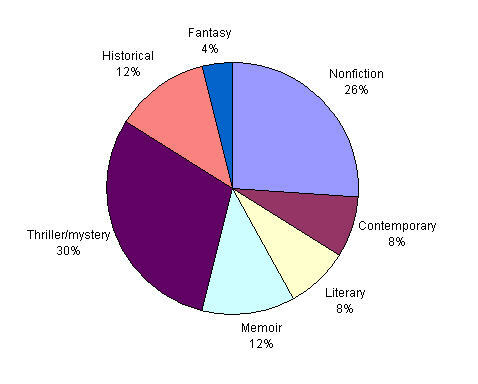 The other genres were fairly close to the prior year in terms of percentages. I will say that I got a little tired of nonfiction by the end of the year. I had planned on reading 15 nonfiction books for the challenge, and I read 13, so I was pretty close! I read 6 memoirs as well, but those didn't count toward the challenge. Overall, it was a good year of reading, although I read fewer books than the year before (only 59 in 2012). I plan for 2013 to be very different here at My Book Retreat. I'm taking a break from accepting books for review. I still plan to read books and review them, but once I get through my backlog of review books, I'll be focusing on books I buy or get from the library. I need a break from the obligation of book tours and author requests. I'm really hoping to get through that whole list by the end of February. Then I'll be digging into some of the books I've had on my bookshelf for years, or heading to the library and picking up books on a whim, or finally buying some of the books I've heard about on blogs but never had a chance to read. I can't wait!! I also plan to feature more author interviews in 2013. I started doing so toward the end of the year, and I really enjoy learning more about authors. If you're an author who would like to participate in an interview, let me know! Finally, I have decided not to participate in any challenges this year. There are some that would be fun, but I don't want to have any specific obligations as to what books I read this year. I want to be able to read whatever I feel like reading at any given time. What are your plans for 2013? Are you making any changes too? Oooh...I love the pie chart! I'm a bit of a data geek myself. Very nice - I wouldn't even know how to do that, though! Looks like a nice mix of genres this year. I gave up on accepting review books a few years ago for the same reasons. I needed to just enjoy reading whatever I wanted - in between book group books, that is! I just started doing reading challenges last year, and I am enjoying them and plan to sign up for some again this year (though I don't know which ones yet! )...but I have a caveat. I only sign up for challenges that line up with what I want to read anyway and not ones that add extra obligations (sensing a theme here?). For instance, I like the Where Are You Reading Challenge because it only involves tracking what I read,; it doesn't affect what I choose. And last year, I signed up for a challenge to read books off my TBR shelves because I really wanted to do that. This year, I plan to look for a challenge to read some classics because I have some on my shelves I really want to get to. Looks like you have a good plan for 2013 - I need to get busy!